The Strongest in Finland certificate is a visible proof of Ofitec Oy:s creditworthiness, reliability and excellent solvency. The companies in the two highest categories of Asiakastieto's 7-step Rating Alfa classification, i.e. approx. 10 % of Finnish companies are entitled to the Strongest in Finland certificate. The requirements to reach these categories are the company's excellent financial key ratios, positive background data and payment behaviour. Ofitec Oy has received the highest credit rating by Bisnode Finland. 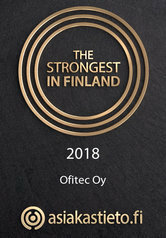 The highest credit rating makes Ofitec Oy one of the most creditworthy companies in the Finnish business community and indicates strong financial stability and business reliability. Companies with AAA credit rating achieve above-average results and have a strong economy with an excellent ability to meet current payment obligations. Currently, only about 2.7 percent of Finnish companies have achieved the highest rating. The credit rating is based on Bisnode´s credit assessment system and the information is updated on a daily basis. Bisnode Finland is part of Bisnode Group, which is one of Europe´s leading providers of credit and business information.